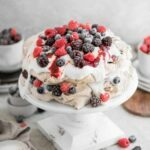 Recipe for Cacao Cream Pavlova Cake, two layers of chocolate swirl meringue, with vanilla cream frosting, raspberry preserves, and topped with fresh berries. Preheat oven to 250 F (approx 120 C). In a medium bowl stir together sugar and cornstarch. Pour egg whites into the bowl of a stand mixer. Using the whisk attachment beat on high for 3-5 minutes. They should be bubbly and stiff. Keep mixer on and slowly add sugar a large spoonful at a time, while incorporating the vanilla. Once all the sugar is added, continue to beat until stiff peaks have formed. Test by turning your bowl upside down. If the meringue starts to move, beat longer. If you have stiff peaks, it should stay firm in the bowl. Sprinkle Cacao powder onto meringue and gently fold in with a spatula. Stir just enough to create streaks. Be careful not to over stir and remove the air from the meringue. Split the meringue between the two baking sheets by scooping out softly with the spatula and adding some shape to each round. Place meringues in the oven on the same lower rack. Once 90 min. has passed, turn off oven. Do not open door. Leave meringues in the oven to cool slowly for an hour to prevent cracking. While meringues are cooling make your cream frosting and then place in the fridge until ready to assemble Pavlova Cake. Place slices of room temperature butter in bowl of stand mixer. Beat butter until fluffy. You may need to stop a couple of times and push butter through whisk with a spatula. Slowly add powdered sugar and continue with whisk attachment until well mixed. Adding the sugar will help your butter whip into a creamier consistency. Add cream cheese, greek yogurt, and vanilla. Continue to mix on medium speed until reach desired thickness. If frosting is too thin, add more sugar a little at a time. Spoon frosting into piping bag. Or for this Pavlova can just use a spoon to dollop onto meringues. Pipe a small fifty cent piece of frosting onto center of cake stand. To prevent moving while adding layers. Set one meringue round onto cake stand. Cover 2/3 of the top with frosting leaving a bare rim closer to the edges. The frosting will ooze a little as you add second layer and berries. Drizzle some raspberry preserves onto frosting. Add a few berries. Repeat with second layer, topping with more berries as desired. Store in the refrigerator and best eaten within a couple of days! Slice and serve!! !